The Earth’s atmosphere is governed by complex, non-linear physical processes is easily perturbed. Changes in solar radiation, volcanic activity, deforestation, construction of cities and roads, large-scale irrigation and – yes – the release of CO2 into the atmosphere, can all impact the Earth’s climate. Firstly, we need to understand the relative impact of human activity versus natural processes on the climate. Then we need to isolate the impact of different human activities to further identify the effect that each has on the environment, especially when many of the activities occur simultaneously. Canada is currently responsible for releasing approximately 1.6% of all global CO2 emissions. The European Union, China, India, Russia, Japan and the United States are collectively responsible for releasing over 70% of the global CO2 emissions; to have any real effect, all six would need to significantly reduce their emissions. 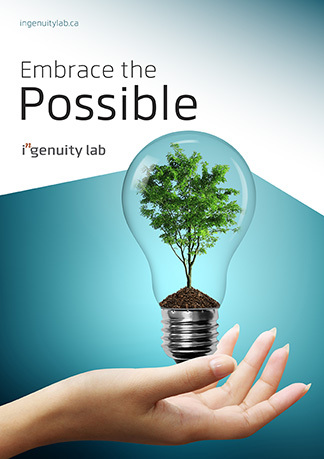 Ingenuity Lab is a unique organisation which is designed to solve many of the grand challenges facing a modern world. The research organisation focuses on the development and deployment of effective solutions for seemingly intractable challenges, including climate change. This book outlines the impact of the Earth’s climate on the Canadian economy and the unnecessary burden it places on Canadians themselves. Humankind has impacted and will continue to impact the Earth; it is our responsibility to access the planet’s bounty in a sustainable way. Our ultimate goal should be to consume resources within cyclic processes to maximise the utility of all of the resources that we harvest. The economic reusing of resources would ensure their continued availability for future generations. At Ingenuity Lab, we believe achieving this vision can only be accomplished through technological innovation.